Or is it a Selmer? Mario Maccaferri's extraordinary life could (and, I believe, will) fill a book; here is but a brief glance. He was born in 1900 in Cento, near Bologna, in Italy. At the age of 11, he became apprenticed to the Italian master luthier and renowned musician, Luigi Mozzani. The young Maccaferri assiduously followed his master's footsteps, bearing his influence for the rest of his life. While learning lutherie, he concurrently pursued the study of the classical guitar. In 1916, he entered the Conservatory at Sienna, remaining there for ten years and graduating with the highest diploma and all honors. Subsequently, he abandoned lutherie to fully devote himself to a career of concert guitar performance. To critical acclaim, his touring took him across all of Europe. 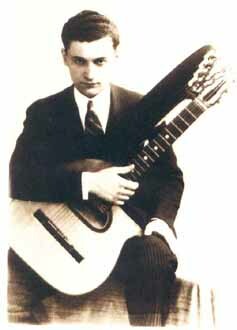 Maestro Mozzani, a superb guitarist and composer for the instrument in his own right, was quite proud of Mario Maccaferri, whom he regarded as a master luthier, musician and peer - an honor never bestowed upon any other of his many protégés. In 1929, Maccaferri settled in London where, amidst his touring schedule, he taught guitar. Ever passionate about lutherie, he dreamt continually of a more ideal, more sonorous guitar. Before long he generated several new prototypes. Presented in London at the dawn of the 1930's, these were the progenitors of his most lasting contribution to lutherie. Upon being shown these latest creations, the Davis brothers, who managed Selmer's London dealership, in turn introduced Maccaferri to Henri Selmer himself. With their assurances and in consideration of Maccaferri's formidable lutherie background with Mozzani, Monsieur Selmer accepted the idea of constructing guitars within the Selmer manufacturing facility at Mantes-la-Ville, near Paris. Soon enough, the atelier was begun under Maccaferri's direction. He drew up the plans for the guitars, had molds and jigs made. Numerous workers, for the most part Italians, took part in the building of the shop and received training from Maccaferri in his production techniques. the vibrating top of the instrument..."
In typical convoluted patent language it went on to describe the physical details of the resonating chamber inside the soundbox of the instrument in question. During this brief but revolutionary epoch the first Selmer Maccaferri guitars were produced. Maccaferri supervised the fabrication of each model. Even the cases for the guitars were made there. By 1933, with production completely operational, Mario Maccaferri was increasingly less in evidence at the atelier. It seems there was a dispute with Henri Selmer which led to a peremptory departure from the firm some time late in 1933. Was it a contract problem? The Selmer company remains discreet on this subject to this day. A consummate guitarist, Maccaferri longed to return to touring, to travel and perform once again around Europe. During the summer of 1933, however, a freak swimming accident badly injured his right hand, bringing his concertising career to an end. Yet his life continued. During his time at Selmer, he had discovered and learned the technique of making reeds for saxophones and clarinets. Maccaferri oriented himself from then on with the making of reeds, creating his "French-American Reed Manufacturing Company." In 1935 he filed for a patent for his shaping of reeds. In 1938, he set up a branch of that business in New York, moving there the next year in order to flee the war in France. Surmounting yet another setback, when the primary source of reed making cane from southern France was cut off by wartime shipping problems, Maccaferri developed a viable plastic reed, the Maccaferri Futurity reed. Endorsed by Benny Goodman and others, his reedmaking enterprise survived the hazards of wartime shortages and propelled him into a thriving business in plastics. With his plastics business on firm ground, offering clothespins, bathroom tile and a host of other injection-molded products, it wasn't until many years later, in the fifties, that the irrepressible luthier in him surfaced once more. Alas, his Maccaferri plastic guitars, while conceived as a serious musical instrument, were not a market success. 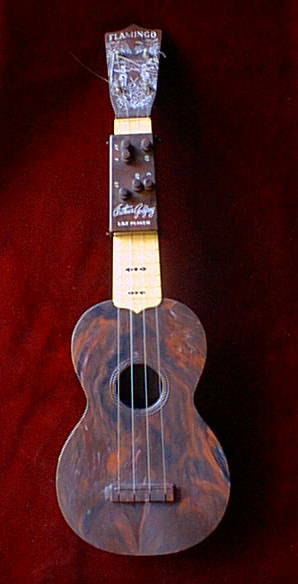 Nonetheless, he handily recouped his guitar losses with the famous plastic ukes with the Arthur Godfrey Chord Finder. Through his long and colorful life, Maccaferri's unique brilliance never diminished. At the time of his passing in May of 1993, he was at work perfecting his plastic violins. If Maccaferri spent but little time at Selmer, two short years at best, he remains the creator of an atelier which produced revolutionary and highly prized guitars. Their success was both immediate and enduring. This article is adapted from an article I originally wrote for Guitar Player Magazine. It is different than the French language article written by François Charle. That article is taken, with François Charle's permission, from a wonderful book called Luthiers & Guitares d'en France, written collaboratively by a number of authorities on French guitars, including Francis Cabrel, Muriel Ferstenberg, and Klaus Blasquiz. It documents, in rich photos and text, the work of more than fifty contemporary luthiers in France, and included several historical articles, this being one. It's published by Editions Chandelle, and you may still be able to obtain a copy from R&F Charle. At the moment, the book is only available in French, but the photos are the heart, and they're very fine. This page © 1998-2010 Paul Hostetter. All rights reserved.